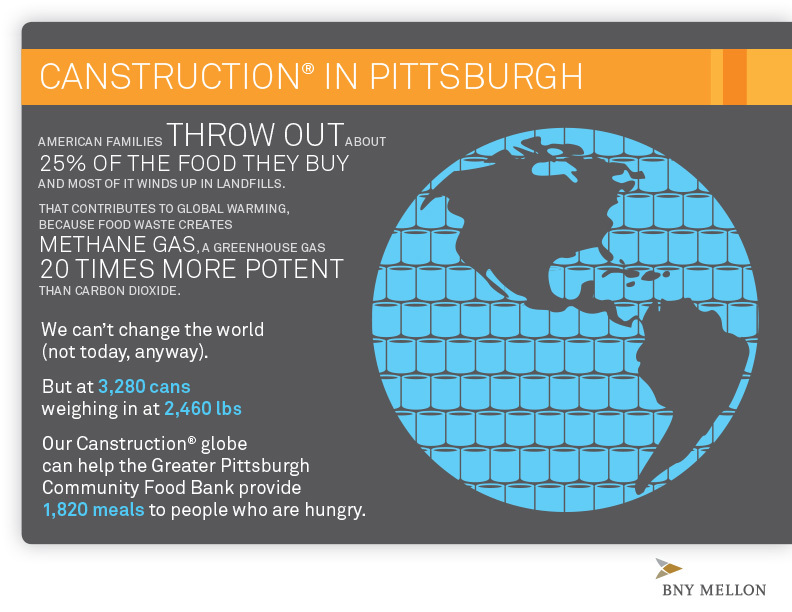 PITTSBURGH, October 21, 2013 /3BL Media/ – BNY Mellon, the global leader in investment management and investment services, has launched a global initiative to raise awareness of issues related to food security and waste through a series of nearly 100 employee volunteer and charitable events to help end hunger. Conceived of and organized by employees, the events are part of BNY Mellon’s Community Partnership program, where employees are encouraged to volunteer with and contribute to a wide range of organizations and receive company- matching contributions and paid time off for their public service and support. “More than 850 million people in the world don’t have enough to eat, and a staggering amount of food is lost or wasted at almost every point in the food chain. Unfortunately, no country or region is immune, including the Pittsburgh region,” said Vince Sands, Chairman of BNY Mellon of Pennsylvania. "Hunger is an issue our employees have supported through ongoing volunteer and donation efforts. Last year alone, we contributed more than $1.2 million, the equivalent of 6 million meals to food-related charities around the world." Among the most unusual and visual aspects of the intiative, BNY Mellon employees will also be partnering with Canstruction®, an international nonprofit, to build giant structures out of canned food in the company's five largest cities. In Pittsburgh, volunteers will join BNY Mellon Chairman and CEO Gerald Hassell and other company executives to place about 3,300 canned food items into precise spots, forming a giant replica of the globe before the food is donated to the Greater Pittsburgh Community Food Bank on October 30. BNY Mellon expects all five of its Canstruction® structures to contribute more than 12,000 pounds of food globally and help its community partners provide more than 9,000 meals to people who are hungry. The globe in Pittsburgh will account for nearly 3,300 cans, 2,500 pounds and more than 1,800 meals for local families and individuals. Canstruction® is a non-profit organization in which teams of architects, engineers, construction firms and students compete to create giant structures made entirely out of canned food. After the event all food is donated to a local food bank. Canstruction was founded in 1992 by the Society for Design Administrators and has since raised over 21 million pounds of food for local communities around the world. Canstruction is one of the largest internationally recognized food drives of its kind. To learn more about Canstruction, visit www.canstruction.org. Learn more about BNY Mellon's world-wide commitment to social responsibility at www.bnymellon.com/csr, or explore www.bnymellon.com/careers for the latest career opportunties. BNY Mellon is a global investments company dedicated to helping its clients manage and service their financial assets throughout the investment lifecycle. Whether providing financial services for institutions, corporations or individual investors, BNY Mellon delivers informed investment management and investment services in 35 countries and more than 100 markets. As of September 30, 2013, BNY Mellon had $27.4 trillion in assets under custody and/or administration, and $1.5 trillion in assets under management. BNY Mellon can act as a single point of contact for clients looking to create, trade, hold, manage, service, distribute or restructure investments. BNY Mellon is the corporate brand of The Bank of New York Mellon Corporation (NYSE: BK). Additional information is available on www.bnymellon.com, or follow us on Twitter @BNYMellon. The 2013 global theme for World Food Day is “Sustainable Food Systems for Food Security and Nutrition.” Established by the Food and Agriculture Organization of the United Nations in 1979, World Food Day offers the opportunity to strengthen national and international solidarity in the struggle against hunger, malnutrition and poverty. Every year on October 16, organizations around the world mobilize advocacy campaigns and events to strengthen the political will to end hunger.